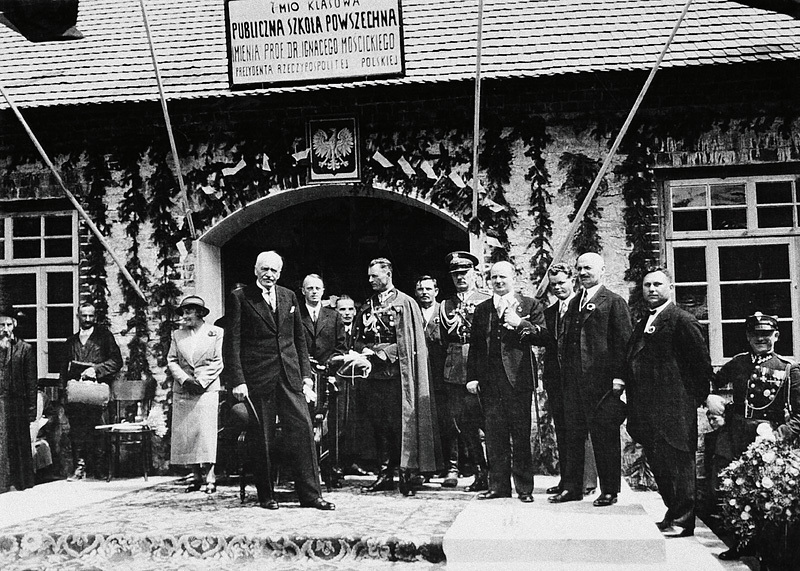 Above: Ceremony of the opening of a primary school, whose construction was supported by Senator Kazimierz Fudakowski, Krasnobród, 1934. Polish President Ignacy Mościcki with his wife Maria in the foreground; Kazimierz Fudakowski among the assembled. After the birth of the Second Republic of Poland most of the political parties opted for a significant reduction of the role of the landed gentry, calling for obligatory dispossession. The land reform with compensation was introduced in 1925. In an attempt to protect themselves from it, the landed gentry stressed their attachment to the land and pointed out that vast estates were more productive than peasants’ farms. After the 1926 May Coup d’État the Sanation government (sanacja) changed its attitude towards the landed gentry, perceiving them as one of the pillars of Polish statehood. That year Józef Piłsudski met with landowning and aristocratic communities in the Tarnowski Family Castle in Dzików and the next year in the Radziwiłł property in Nieśwież. As a result of those meetings, the Polish landed gentry lent their support to the new government, which was to pull the country out of chaos. The interwar period was a time when the landed gentry had to strive for maintaining their material status. The process of reduction of vast estates for the benefit of peasant farms lasted many years. Yet the rural population remain land-hungry despite the approx. 6 million acres of land parcelled out and sold to peasants during 1918–1938.